Garnier Skin Naturals Sun Control Moisturizer: Garnier sun screen that is moisturizes your skin and protects from UVA and UVB rays an every day solution, to help prevent skin darkening and premature aging. Its unique formula blends a moisturizer with selected ingredients: Mexoryl S X to give protection from the Sun's UV rays. - our offered sunscreen lotion is processed by using top quality of ingredients in accordance with the set medical norms. This sunscreen lotion is acclaimed in the market for its best protection against sunburn. 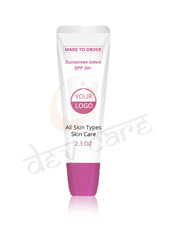 Also, the sunscreen lotion provided by us is tested on several quality parameters to ensure its quality.